In the past few weeks, we have been gearing up for the two biggest events on the Sage calendar: the Sage Inspire Tour and the start of Sage Summit registration. The Sage Inspire Tour will be rolling into Charlotte next month, and we’re thrilled that this event is finally coming to our neck of the woods. 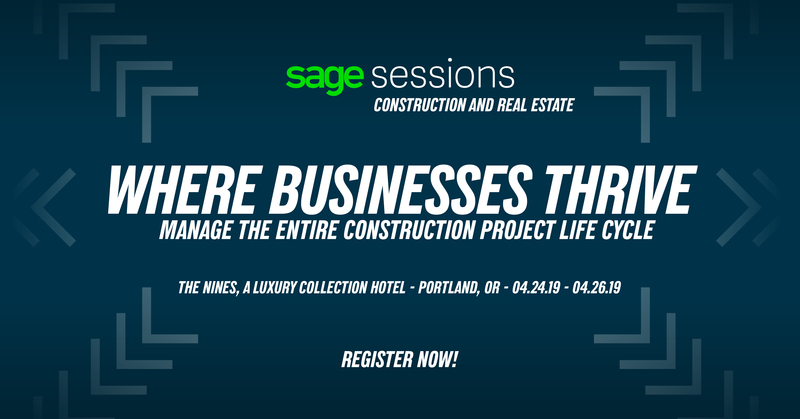 For the Sage Construction and Real Estate crowd, there’s an additional event on their schedule that is related to Sage: The TUG National Users Conference. This is a home-grown conference dedicated to customers who use Sage CRE products. Even though this is an independent organization, Sage is highly supportive of this event and even participates in the conference. But ever since we started mentioning these events in social media, in e-mails, and in our Coffee Break meetings, our Sage CRE customers have been bombarding us with questions about which event is right for them. Thankfully, and as always, the folks at Sage are always willing to help us partners when we need some answers. What are these Sage events? 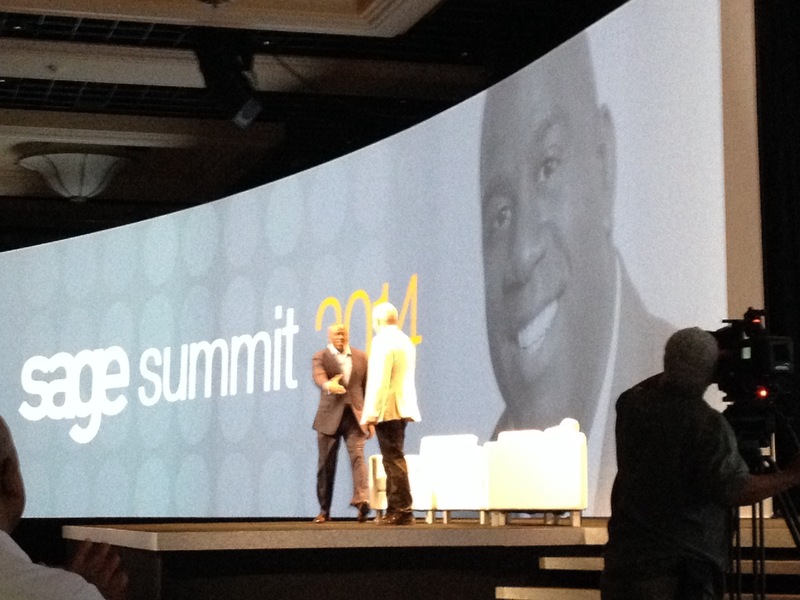 Ervin “Magic” Johnson was one of the celebrity business owners who spoke at Sage Summit last year. Sage Summit is the No. 1 event on the Sage calendar. Although it has gone through many changes during the years, Sage Summit has evolved into a four-day event for Sage customers and partners to learn about the latest and greatest Sage has to offer, plus what the future has in store. Everything you expect to have at a business conference is there: industry-specific sessions, hands-on training sessions, general business sessions, one-on-one time with Sage representatives, and networking with fellow Sage customers. Recently, Sage tightened up this event to include less glitz and glam (no more awards banquet) and more chances for networking and learning. For example, this past year, Sage Summit included several round-table discussions with celebrity entrepreneurs and other business leaders. All industry segments are represented at Sage Summit: Sage Construction and Real Estate, Sage ERP, Sage HRMS, Sage CRM, Sage Fixed Assets, etc. This gives the conference an interesting flavor. You may have a Sage ERP-only partner sitting next to a Sage CRE customer at breakfast. They may share some interesting insight with each other that they may not have otherwise experienced if they were sequestered in an industry-specific conference. Also, we’ve mentioned in the past that some Sage CRE customers thought of Sage Summit as an “ERP-only party.” This is not true in the least. Last year in the Sage CRE keynote address, they announced that there are more Sage CRE customers than any other industry segment within Sage. The Sage CRE team is represented on the trade show floor along with all the other industries, as well as many third-party products specifically geared toward construction and real estate. As you may have noticed before, we’re all about Sage Summit. We can’t talk enough about this annual event because we think all of our customers — whatever industry they come from — will find value in attending. This year’s Sage Summit will be July 27-30 in New Orleans. The TUG National Users Conference is the largest conference in the United States specifically geared toward Sage Construction and Real Estate training and education. This four-day conference has a much greater emphasis on training and education than Sage Summit, but still includes some product direction sessions. The good news is that with the rebranding, TUG began looking at bringing in other Sage CRE products under their wing. A few years ago, they included Sage Estimating in their conference. And this will be the first year that Sage 100 Contractor (formerly Sage Master Builder) will be included. Sage representatives will be on hand at this conference to answer questions. There is also a trade show with many products specifically geared toward Sage CRE products. The TUG National Users Conference will take place May 12-15 in Las Vegas. The Sage Inspire Tour is designed to be a series of free, one-day symposiums across North America, giving Sage customers a taste of what happens at Sage Summit. This is a great idea, because not everyone can afford to go to a week-long conference. We’re not just talking about money: Having several employees out of the office at the same time can be a burden to some companies. But as I’ve told some of our customers here in the Charlotte area, since the Sage Inspire Tour is free, you can attend half a day if you need to and not feel you didn’t get your money’s worth. These events are part industry-neutral business sessions and part Sage- product-specific sessions. We had customers asking us if there were sessions specifically geared toward Sage 100 Contractor. Meuy Tzeo, a marketing specialist for Sage Construction and Real Estate, said that the Sage CRE sessions aren’t product-specific; however, they cover both Sage 300 CRE and Sage 100 Contractor equally. One of our Sage ERP customers, Dave Watkins from Star Roses and Plants, attended the Sage Inspire Tour stop in Philadelphia back in November. Dave reported back that it seemed to be bit of a repeat of Sage Summit. However, that didn’t mean the event wasn’t worth his while, especially since was about an hour’s drive to the event. The Sage Inspire Tour will have two stops per month through May. So which Sage CRE event do I attend? We had one customer who, due to budgeting, could only attend either Sage Summit or the TUG National Conference. Judi said it would be a viable alternative to attend TUG (since this customer needed training) and a Sage Inspire Tour stop (since their office was so close to an upcoming event) to get the best of both worlds on a budget. If you’ve been to Sage Summit, the Sage Inspire Tour may be a bit of a repeat. But if you haven’t attended Sage Summit and/or you’re near one of the upcoming tour stops, it’s still worth attending according to one of our customers. Because it’s a smaller event, you get a little more one-on-one time with Sage representatives. It’s also free, so you can attend on your own schedule if you’re within driving distance. * Danielle Cote, the Vice President of Events for Sage, informed me today (March 3) that there would be more training sessions added to Sage Summit this year. So there you have it. We highly recommend attending at least one of these events. Sage always puts on a solid event, as does TUG, so we hope you can fit it in your schedule to attend.